THE WORLD DID NOT END — END TIMES CLASS COMING SOON!!! 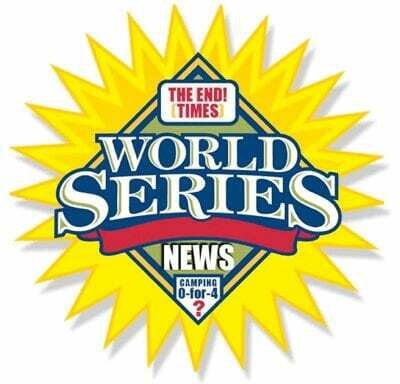 Another baseball World Series has concluded, and perhaps you missed this headline: Harold Camping Goes 0-for-4; John Lynn Now Batting. Harold Camping is an elderly radio preacher who reportedly predicted “the Apocalypse” in 1988 and then again in 1994. Of course nothing like that happened then other than the Clinton presidency. Earlier this year Camping claimed to have used Bible verses to calculate May 21 as the date for the “Rapture” of all Christians, which was to be followed by the destruction of the planet on October 21. When Christians did not blast off in May, Camping revised his prediction to state that both events would occur on October 21. It is now November, Camping is 0-for-4, and the earth is still intact. Come on, what kind of psycho God would destroy the world just after the World Series had begun? There is rampant confusion among Christians about “Eschatology,” that is, the chronology of “end times” biblical events that will conclude life as we know it on earth and usher in the true “New Age.” For example, Tim LaHaye, co-author of the best-selling Left Behind novels about the end times, called Camping’s May prediction “100 percent wrong,” citing Matthew 24:36 (NRSV): “But about that day and hour no one knows…” except God. LaHaye was right about Camping being wrong, but he does not understand that Jesus’ statement in Matthew has nothing whatsoever to do with Christians or the Rapture. There are so many biblical holes in Camping’s theory that space prohibits even listing them. Suffice it to say that there is a primary reason why Camping, LaHaye, and so many other Bible teachers past and present who are expounding upon “Eschatology” continue to add to the confusion. They fail to distinguish between what is written to and about Israel (Jews) and what is written to and about Christians. In particular, they fail to distinguish between what is written to and about pre-Pentecost (Acts 2) believers (whose salvation was conditional) and post-Pentecost Christians (whose salvation via New Birth is unconditional). At the end of the Millennial Kingdom, Satan is loosed from his prison, whereupon he goes forth to deceive millions of people, making one final assault on Jerusalem. God sends fire from heaven and destroys them (Rev. 20:7–9). Then He destroys Satan in the lake of fire (Rev. 20:10; Ezek. 28:18). Then the Lord Jesus will raise from the dead every other human being who has ever lived, those who were not already raised at the Rapture of the Church or the Resurrection of the Just. He will righteously judge and destroy all wicked people (Rev. 20:11–15), and then create a new heaven and a new earth (Rev. 21:1ff), after which the saved of the ages will forever enjoy a glorious life. It is only in this current “administration of the secret” (Eph. 3:9) that people who confess Jesus as Lord and believe that God raised him from the dead (Rom. 10:9) are instantly “born again of incorruptible seed” (1 Pet. 1:23 – KJV) and guaranteed everlasting life in Paradise. If you have never made Jesus Christ your Lord, you can do so right now. 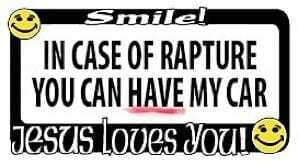 See Romans 10:9, do it, and then rest assured that you are saved from sin and death. As a part of his Body, the Church, you will be gathered up and given a new body when he comes to rescue us from this present, evil age (Gal. 1:4). Amen. See you there! In the meantime, let’s proclaim God’s wonderful Truth and set people free!